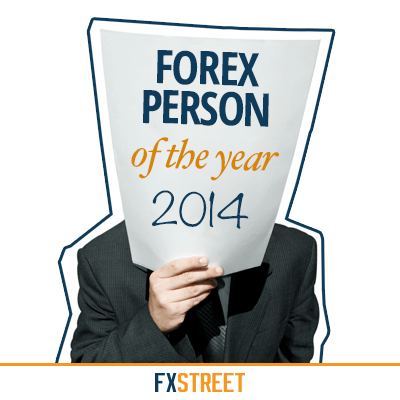 The Forex Person of the year 2014 is Adam Button, the Managing editor of ForexLive. When our team discussed who could be the person of the year 2014, it seemed that one and the same name was coming back and back again… Adam Button. Everyone seemed to agree that he has done an excellent job during the year at the front of ForexLive, strenthening an already successful model. In addition, his decision to take over the management of the company (together with co-analysts Eamonn Sheridan, Mike Paterson and Ryan Littlestone) in September of this year represented a vital move for ForexLive but also excellent news for the sector with the arrival of a new independent website (ForexLive used to be property of the broker FXDD). Without Adam Button, ForexLive would not be what it is today and could even have died, with the damage that it would have caused on the Forex retail sector. Another remarkable and trader-oriented decision is the appointment of Greg Michalowski: he’s been brought in to help and make of ForexLive, almost only used by experienced traders, a website more accessible to newcomers. This way, ForexLive will expand his readership and at the same time promote the education of traders, something that FXStreet’s always supported. ForexLive is a news website which provides insight into the market from a trader’s perspective. “When we post about news, it’s not just the headlines but we explain why and how they change our thinking about the market. It has to be extremely fast and perfectly clear”, explains Adam Button. Adam Button was previously the chief currency strategist at XForex and has also worked with Intermarket Strategy. He was formerly the head of the markets team at the Canadian Economic Press and is a graduate of Ryerson University. Adam lives in Montreal and is very active on Twitter: @FX_Button. We’ve talked with him about ForexLive, its identity, goals and future. Here are the best bits. We have aroun 170,000 readers per month but what makes it different is the core of professional traders. Whether it’s at institutional trading desks or people who make a living trading from home, our readers are locked onto the site all day. For us, that’s a great compliment (by brad). But the greatest compliment is when we hear that a trader has taken a trade with us or used something we said to make a wonderful trade. Earlier this month we were selling t-shirts and someone bought one to thank us for the hundreds of thousands of dollars he made in part because he always had a window open to ForexLive; the gratitude is genuine and as an analyst it’s the best feeling you can get. We’re all traders and that’s the biggest difference between us and other sources of news. We focus all our energy on finding out what is happening in the market and why. We always provide the facts so people can make a decision but we also share our interpretation about what something means for the market or what we’re hearing from other sources in the market. Our market focus totally guides what we write about and it allows to focus on the 1% of news that moves markets and filter out 99% of the headlines that are noise and can confuse people who don’t have the experience in the market or in trading. What really resonates with our readers are the war stories. We’re traders too and know that foreign exchange trading can be lonely but it’s also universal. Everyone who trades experiences the same emotions and for us the times where we get to share frustration and joy have helped us build a strong community. It’s our favorite thing to do and we’re always blown away by the response. Overall, we plan on a whole new look for the site but we’ve heard from traders many times that the styles and colors don’t matter. They want the content as quickly and cleanly as possible and that’s what guides us. We don’t want to be just a hub for traders who are already making money trading, we want to help others get to that level. When you jump into our site there is nowhere to learn and the rush to offer real-time analysis doesn’t leave time to explain the finer points but that’s going to change. We’ve brought in Greg Michalowski as Director of Client Education and Technical Analysis. He’s creating the content that will help people understand what the real-time headlines mean and how the market really works. Part of it will simply be organizing the content better. We have more than 160,000 posts on ForexLive and there are some real gems so we want people to be able to explore that. We will also want to be a hub for tools. We believe we’ve built the most-trusted brand anywhere in retail foreign exchange and we want to use that to guide people toward products and brokers that are trustworthy. That’s a big part of where we’re headed in 2015. Another change is that our tagline. “Tomorrow’s Conventional Wisdom Today” doesn’t capture all of what we want to do. We’ve been fighting to stay ahead of the curve for six years and that’s helped us build a trusted brand. The trust of our readers is our most valuable commodity and that’s how we want to be known so we’re going to change up that line. The Forex Person of the Year is a title FXStreet has been giving since 2011 to a person or group of people we believe has positively contributed to make the Forex world a better place for the retail Forex trader. In 2011, it was Michael Greenberg from ForexMagnates, in 2012 Andrey Pavlov and Ilya Holeu from Spotware Systems, and last year, Laith Marmarchi and Nicole Elliott from ForexTradingTV. Congratulations to Adam and the Forexlive team well deserved!